Thank you for sharing your experience. First and foremost, I would like to apologize for any stress resulting from the manner of communication provided by our sales representative. We would have loved to accept your business but unfortunately, could not, which is why you were never charged. Above all else, providing excellent customer service is our main goal and all of our customer service agents are highly-trained and qualified. As the fastest growing travel company in the world, we sometimes fall short of our goal – however, we are constantly looking to improve. All of our special promotional packages are subsidized up to 77% by the participating resorts, and it is the resort (not BookVIP) who sets forth the eligibility requirements for these promotional packages in the Terms and Conditions. The Terms and Conditions governing every vacation package can be found at the bottom of the hotel offering page on BookVIP’s website. This is why we ask you to call after booking online to confirm your eligibility and that you have read and understood the terms. We agree that our representative should have covered this info with you more clearly and thanks to your message we are re training him and the rest of the team on how to properly address this. The purpose of these promotions is to introduce first time visitors to the participating resorts vacation club options and they hope you consider joining one of their frequent visitor programs and thus they ask that if married both travel together so that you can consider the options together. Of course there is no obligation to join anything but in order to receive the discounted price both must attend the resort discovery preview. 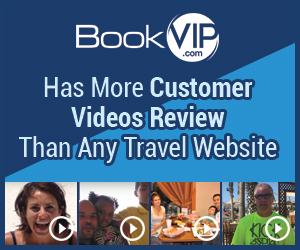 BookVIP has more video testimonials from happy customers than any other travel website in the world. Please refer to http://bookvipreviews.com/. Again thank you for your comments as we are addressing this with entire staff today. I was so excited after finding bookvip through a facebook ad. I thought I'd finally found a way to plan an affordable vacation for my kids and I.
I spent over an hour on their website looking at their different packages, when I finally found the perfect place in Pigeon Forge, TN. I clicked "book now," typed in all of my info (including my FULL credit card number), only to be told I had to call a number to verify my reservation. I immediately called, of course. The guy who answered was very disengaged as he began asking who I was traveling with. I said just my kids and I. He asked if I was married. I told him that I'm separated (for 2 years now btw). His whole demeanor felt very callous and condescending. He said "oh wowwww ma'am you have to be legally single to qualify for this special." I said "I am legally single. We've been separated for over a year" He argued back "ma'am that's not how it works. You have to be divorced, or your spouse must be present with you." Of course I wanted to know why which he says "how am I supposed to know? We're just a booking agency"
What a HUGE waste of time. Maybe you guys should be more clear about all of the "requirements" instead of misleading people. My kids are devastated. SHAME ON YOU!!!! Product or Service Mentioned: Bookvip Vacation Package Booking. Review #855807 is a subjective opinion of User855807.